Choosing the right stroller for your child can be a struggle for new parents. You may not know what features you actually need or which you could live without. Strollers are available in a broad range of prices so you could end up spending more than you bargained for on a stroller that isn’t everything you expected. A good stroller should be easy to fold and unfold, provide your child with a smooth ride, and be able to take on the various types of terrain you walk on the most. Chicco is a great brand when it comes to baby gear. Their strollers are lightweight yet built to last. Most models are designed for easy transport and unfold with ease. There are several great models available from the brand, but how can you tell which is the best Chicco stroller for you and your child? Which Chico Stroller is the Best for You? We have compared three of the best Chicco stroller products available to compare and review so that you can narrow down your choices and make a well-informed decision. The Chicco KeyFit Caddy has plenty of features that make it a great choice for busy parents. This stroller has a lightweight yet strong aluminum frame that makes it easy to carry around. The compact design allows it to fit through narrow spaces and the simple one-hand fold feature helps save time while jugging shopping bags and your baby. It is a great option for parents who are always on the go. The stroller frame is designed to hold a Chicco KeyFit infant car seat, sold separately. There are few user complaints about this stroller, but some of the most common are that the wheels can make the ride rough and the cup holders are shallow. The Chicco Liteway Stroller is easily considered one of the best Chicco stroller products currently available. It has a strong and sturdy design that can provide new parents with peace of mind. The five-point safety harness will keep your baby in place, and there is a roomy storage basket that makes it the perfect choice for day trips to the zoo, beach, or park. This stroller has a comfortable multiposition reclining seat that can be extremely useful when your little one falls asleep while on the go. The Chicco Liteway has a strong and stable design, yet it is also lightweight and easy to maneuver. This stroller is easy to fold and store, and it doesn’t take up much space. It is easy to push with very little effort. 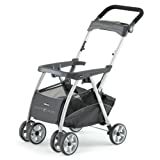 While there isn’t much that parents dislike about this stroller, some have mentioned that the sun canopy is too small and they wish that the stroller came with a child tray, which could be useful for meal time on the go. This convenient travel system is one of the best Chicco stroller systems available. 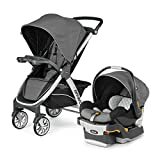 The Chicco Bravo Trio Travel System includes a KeyFIt 30 Infant Car seat, a Bravo toddler stroller, and a travel system that allows the car seat to snap into the stroller seat. Now you don’t have to transfer your child from their car seat to a stroller when they are taking a nap after a long car ride. Instead you can simply keep them in their car seat and place it in the travel system. This system collapses easily for stress-free storage and towing. And it is the only stroller your child will ever need. Users like that this stroller system offers a smooth ride and its easy to push. It also collapses easily and it isn’t difficult to store. A few of the things that users dislike about the Chicco Bravo Trio Travel system is that there is no child tray included and that it can take up a large amount of space when folded. However, most all travel systems will take up the same amount of storage space. There are a few things to consider before buying a new stroller or travel system. Just because a baby stroller has great reviews, it doesn’t mean that it is the right one for you and your child. If you plan to take the stroller with you while running errands or visiting the park, any of these strollers would be a great choice. 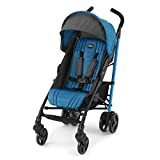 But if you want to take the stroller on more rugged terrain, you may need to find something that is more durable so that it will last throughout your walks on rugged paths.